An I2C operated servo controller (not only for Lego-NXT). If you need quick and relatively "precise" movements, a servo controller could be what you need. 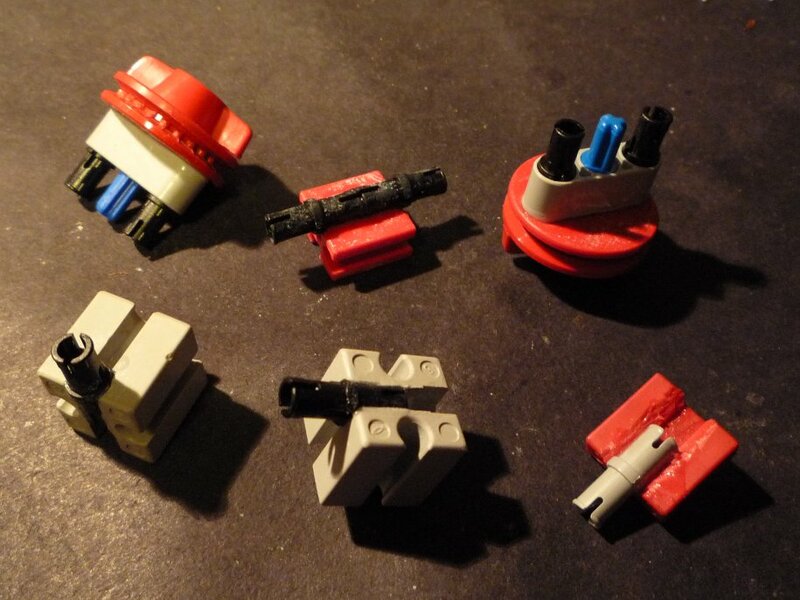 This circuit is cheap (~3 Euro) and easy to reconstruct. Only a PIC 16F819 and a few other, passive components are needed. A standard analog servo has its mid-position on a pulse/pause ratio of ~1.5ms/20ms. Decreasing the pulse length down to ~1ms corresponds to a ~-45° shift, going up to 2ms will cause a ~+45° movement. Depending on your servo type (and quality ;-) you may(!) extend the range of movement by up to 80-90%"
(Usual RC-equipment (like my Futaba T10C or my old FC-16) allow not more than +-20%). Especially digital servos, which internally operate with a much higher repetition rate, will draw huge currents if their movement is blocked! This will damage gears as well as the motor! 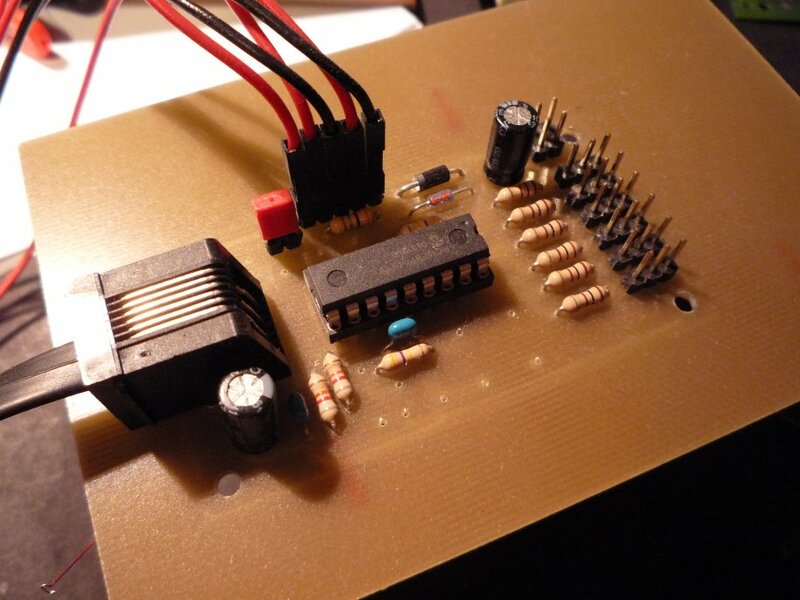 This little servo controller allows you to use the full range of any servo. ; Values must be 1 - 180 (other values may not work as expected ;-). Standard left/right values. Click to enlarge. Insane left/right values. Click to enlarge. I used a ~25ms repetition rate. Click to enlarge. Although possible, it is NOT RECOMMENDED to power servos from the NXT! To limit misuse, I added a 10E resistor. This will power 1 servo of the D47/FS31/SD100 class. Use an external 4xNiMH pack, this will work with every servo available. Do not care about the external oscillator, it is not required for this limited version of the servo controller. Do not forget to apply the 2 wire-wraps! Click to enlarge. -- !!! pbLua v18a (or newer) required !!! -- No nifty "classes", this time. nxt.InputSetType(port,10)  -- NEW: pbLua v18a; I2C is now type "10dec"
--** invent) MUST NOT BE FASTER THAN 30ms! -- !!! KEEP RAW VALUE (incl +90) >0 and <=180 !!! wait(4) -- do NOT change this!!! -- Just a few quick and dirty testing routines, from here down. I planned extensions for default values in EEPROM as well as automatically controlled servo movement by pin inputs. This is not yet (and may be will never be) implemented. A central distribution point for cabling 6 servos is sometimes unhandy. Well, I invented something better: ServoBus.